Pretty soon we’re going to have to change the name of this blog from “Every Food Fits” to “Chef Michael Kiss’ Culinary Awesomeness” or something. Our BFcheF (Stacey really should trademark that phrase) Michael Kiss is at it again, dishing out amazing meal ideas. Another friend of Every Food Fits, Daniel Giusti of 1789, has recently taken area foodies to farm markets to shop and then cook in his kitchen. Stacey had every intention of cooking for the Chef & Mrs. Kiss, but it turns out that she’s better at being a prep cook when in the presence of a real chef. Watching Chef Kiss work from nothing to putting a meal on the table is impressive. A vegan meal, no less! His response? 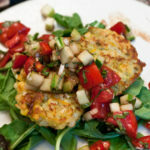 Zucchini fritters with tomato-cucumber salsa. Impressive, no? We took a brief trip to Arlington’s Columbia Pike Farmers Market at Walter Reed Drive and the Pike (it’s there every Sunday from 9 a.m. to 1 p.m.) where we picked up a few items such as cantaloupe, arugula and other fresh, local ingredients. 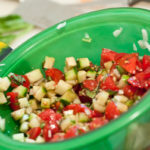 Upon returning to Fortaleza Viera, the chef went to work in the kitchen, chopping tomatoes and cucumber from his home garden and mixing it with diced garlic and onion, and light dashes of balsamic vinegar and olive oil. The lack of meat and other animal products left Stacey bewildered, so she opened up a bottle of pinot grigio to soothe her nerves. Then it was time to julienne. 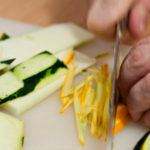 FYI – it’s really hard to julienne without a box grater or prowess with a knife. (Stacey ditched her box grater in a 2005 cleaning binge.) So the chef used his prodigious skills to julienne half of the squa-chini hybrid veggie. 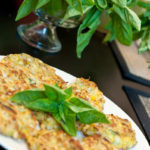 He put the slices in a bowl with corn sliced fresh off of the cob, half of a hot pepper from his garden and flour, which served as a binder to keep the fritters together. Since we were eating vegan, he declined to add an egg, which provides cohesion. After about 20 minutes in the oven, the fritters were still loose, so Chef Kiss lightly fried each fritter in canola oil on the stovetop. Who knew that one huge mutant squash could provide inspiration for such a delectable meal? 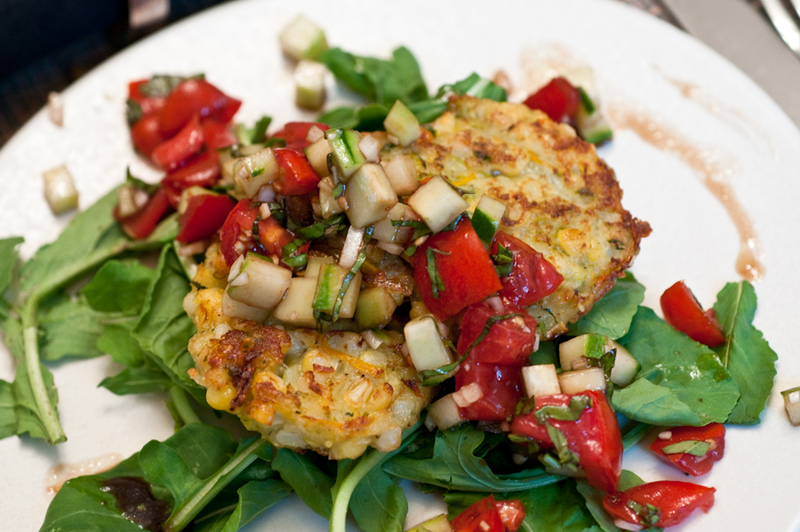 What are your creative ways to include more vegetables in your cooking, whether it be farmer’s market fresh, or not? Please share your ideas on incorporating farmers market finds into your home kitchen. What have been some favorites from your summer?